At one point, self-driving cars seemed like something out of a futuristic movie. But it is time to put on your seat belt, because the future is here. Self-driving cars hold much promise in reducing accidents and traffic fatalities—autonomous cars do not drive under the influence, recklessly, or get distracted. They can help keep drunk drivers off the road and reduce traffic by encouraging ride sharing. Number three—lack of regulations—is important to watch. The nation is looking to California to set the standard for autonomous vehicles, including regulations and matters of injury and liability. Autonomous vehicles open up an interesting issue regarding liability. Most car accidents with self-driving vehicles so far have been caused by human error, meaning the accident was caused by another car with a human driver. In cases like these, it is obvious where liability lies. But what if the self-driving vehicle caused the accident? Perhaps the brakes failed, or the headlights burned out and another car or pedestrian was unable to see it. Under current law, liability is with the automaker. Right now, if a defective vehicle causes an accident, autonomous or not, the manufacturer is responsible. California regulators, however, are currently considering a recommendation from General Motors that would limit the liability of companies that make self-driving cars. The recommendation advises that, in the event of an accident, carmakers should be protected from liability if the owner of the vehicle has failed to keep up with routine maintenance. 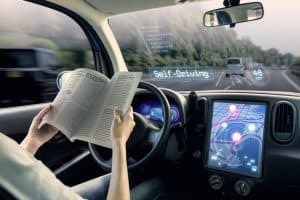 This means, in the event of an accident where the self-driving car is at fault, liability would lie with the owner of the car and not the automaker. Under this recommendation, “maintenance” could mean anything from underinflating the tires to skipping an oil change. It is true that failure to maintain a car can make it less safe, but this proposed provision is new territory, as the vehicle owner is not operating the car. Every accident has a cause, and it may be difficult to assign blanket liability to a specific entity for all accidents. Some watchdog groups believe this is a dangerous loophole and liability should be left up to the courts. No matter how this issue of liability plays out, Taylor & Ring are here if you are injured in a car accident that was not your fault. Our attorneys fight for the rights of accident victims throughout the Los Angeles area. Call us today at 310.776.6390 or complete our contact form to schedule a consultation.